Though smart devices are improving and so too are the batteries that power them, device processors are becoming more powerful and applications are becoming more power-intensive. With smartphones and tablets now so widely used, it’s useful to have a backup power supply in the car for long journeys or busy days. Modern vehicles often have AUX cables for wired charging in the glovebox, and some may even have built-in USB ports, though most older vehicles do not. As a result, you might benefit from having a portable phone charger, particularly given their small price tag. Anker is well-known for highly-durable and high-quality products, particularly chargers and power banks. 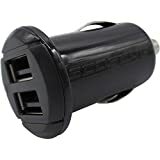 We’ve selected this unit for being an inexpensive in-car charger that doesn’t skimp on product quality, while having enough space for the driver and front-seat passenger. This Anker device uses custom Power IQ and VoltageBoost technologies to make fast charging possible, capable of powering up some devices in as little as an hour or less. It boasts being one of the industry's smallest in-car USB chargers, yet still has 2 individual ports. Despite being connected to the cigarette lighter port, this unit runs very cool, even when fast charging. Overall, it is of a very high-quality and unlikely to break, even if accidentally dropped or stepped on by a passenger. One of the common problems these type of chargers have is that the LED light can be very bright when connected at night. It’s also difficult to see whether the charger is properly connected unless the unit is positioned at just the right angle. 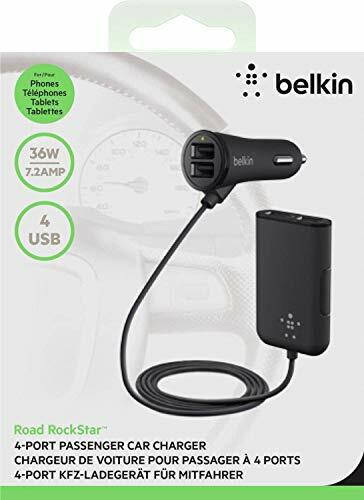 Belkin is a well-known brand in the industry, providing a range of power and networking products. 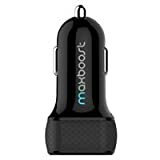 The Road Rockstar is a 4-port USB charger for use with smartphones or tablets and comes with a very reasonable 3-year warranty. This charging hub contains 4 USB ports capable of charging at regular speed. The extension cable will reach the rear of any family vehicle with ease. Though the plastic casing of the extension ports isn’t the most durable, the wire that it is attached to can survive a lot of wear and tear. One positive point about this product is that it has 2 means of extension. 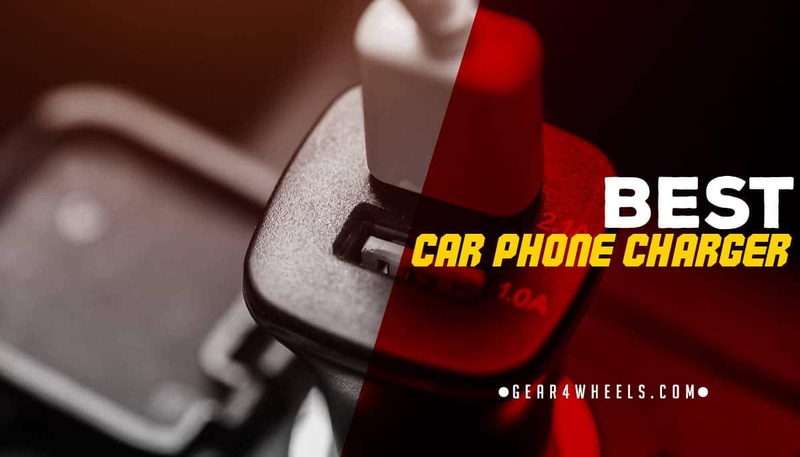 A 6-foot cable offers easy reach into the rear seats or allows cabling to be run beneath the trim of the dash, whilst an extension port creates an additional 2 ports for a total of 4 devices charging simultaneously. The design of this product is not on-par with the price tag attached to it, especially considering the cheaper options available. The plastic design feels as though it would easily break if accidentally trodden on, something that could easily happen in the car. This charger also lacks fast charging, which is something than other cheaper options have. 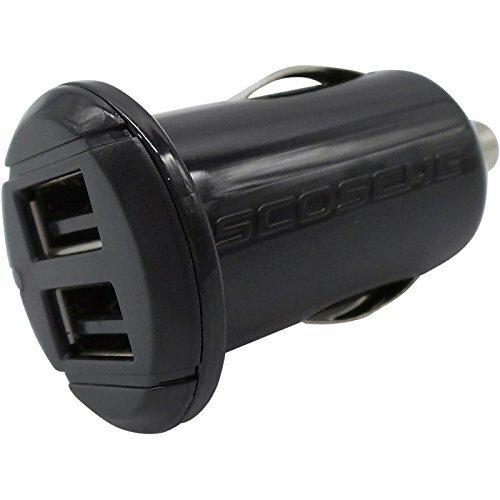 The SCOSCHE in-car ReVolt charger is an interesting product in that it may lack some basic functionality compared to other products –namely, a second or third USB port– but makes up for it in aesthetics and optimization in other areas. As a result, it makes our list. This charger has a 12-Watt USB port with fast charging and is optimized for use specifically with iOS devices (though others are supported). It has a super-long warranty for such a small product, and it is designed to sit flush with your dashboard controls for unobtrusiveness. Though the device has just 1 USB port, that port is designed for compatibility with fast charging, meaning it’s possible to completely charge some products in under an hour. This is useful for when you’re running low on juice and don’t have much time to plug in. It’s also possible to close some lighter socket covers entirely even whilst this extension is left connected. The obvious issue with this product is that it only offers 1 USB port, while many similarly priced competitor models have at least 2. It is also liable to lose its connection very easily if bumped or jarred whilst driving. From a less-recognizable brand comes a stand-out product, offering the most USB ports we've seen in any of the products that we have listed out here. For around 1.5 times the cost of the other devices we’ve listed, you can get more than double the number of charging ports. 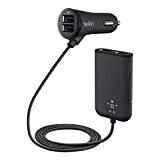 The Jelly Comb in-car 6-port charger has SI technology specific to this brand, which recognizes the connected device to deliver the optimum charging current. It also doesn't skimp on power despite the 6 ports, utilizing fast-charge technology. The obvious benefit to this product is the whopping 6 USB ports that it provides; most competitors stop at 2 or 4 at the very most. 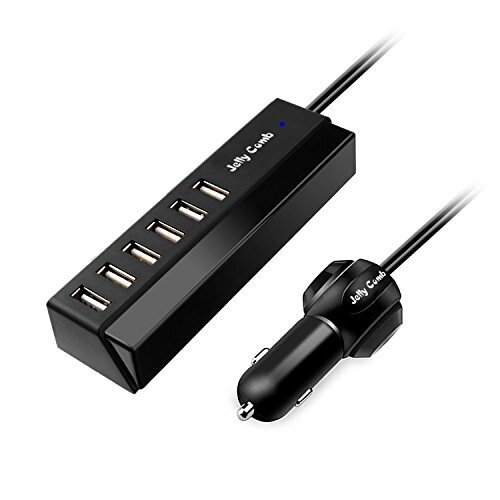 Another positive aspect is that all 6 USB ports are compatible universally, offering charge to Android, iOS, or any other USB-compatible products. The cord attached to the 6-port USB hub is only around 3.3-foot in length, making it slightly too short for longer vehicles such as people carriers. Not a huge issue but can get messy when multiple people are trying to plug into the hub from both the front and back seats. Multiple charging devices can also cause radio static. Maxboost is a brand that come relatively cheap in the industry, and one that has good customer praise. The design of this product is not dissimilar to the Anker product, though the design isn't quite as high in quality. 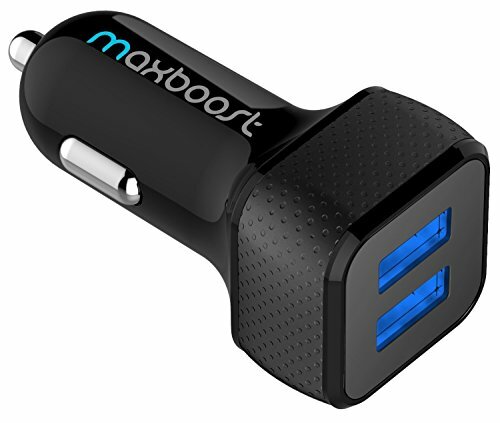 The Maxboost in-car charger provides 2 USB ports for charging any USB device while on the move. Output is 4.8 Amps or 24 Watts, shared between both ports, with internal protection against short-circuiting, overheating, and over-charging. 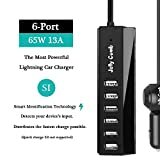 The ports on this device are lit with LEDs for easy locating in the car, at least during the night. It has powerful output, capable of providing nearly a full charge in just a short commute. As such a small product, this unit can easily be stored within the glove compartment between uses. When connected, the seal formed between the port and the charger could be tighter; small bumps can cause blips in connection. It also heats up quickly. Surprisingly, this charger has the opposite problem to most, in that the LED isn’t bright enough for daytime use. 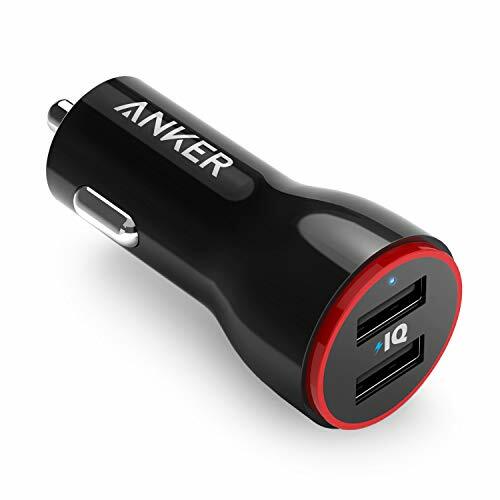 Our choice of the best in-car charger from those products listed above is the Anker 24W Dual USB. Though all these products are relatively close in price, you should consider reliability and safety when buying low-price electronics. 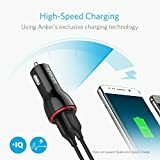 The Anker brand is one that has come to be well-known for high-quality charger or power bank products, and as such we can place trust in the safety and quality of this product for long-term use.